Real lenses behave somewhat differently from how they are modeled using the thin lens equations, producing aberrations. An aberration is a distortion in an image. There are a variety of aberrations due to a lens size, material, thickness, and position of the object. One common type of aberration is chromatic aberration, which is related to color. Since the index of refraction of lenses depends on color or wavelength, images are produced at different places and with different magnifications for different colors. (The law of reflection is independent of wavelength, and so mirrors do not have this problem. This is another advantage for mirrors in optical systems such as telescopes.) [link](a) shows chromatic aberration for a single convex lens and its partial correction with a two-lens system. Violet rays are bent more than red, since they have a higher index of refraction and are thus focused closer to the lens. The diverging lens partially corrects this, although it is usually not possible to do so completely. Lenses of different materials and having different dispersions may be used. For example an achromatic doublet consisting of a converging lens made of crown glass and a diverging lens made of flint glass in contact can dramatically reduce chromatic aberration (see [link](b)). Quite often in an imaging system the object is off-center. Consequently, different parts of a lens or mirror do not refract or reflect the image to the same point. This type of aberration is called a coma and is shown in [link]. The image in this case often appears pear-shaped. Another common aberration is spherical aberration where rays converging from the outer edges of a lens converge to a focus closer to the lens and rays closer to the axis focus further (see [link]). Aberrations due to astigmatism in the lenses of the eyes are discussed in Vision Correction, and a chart used to detect astigmatism is shown in [link]. Such aberrations and can also be an issue with manufactured lenses. (a) Chromatic aberration is caused by the dependence of a lens’s index of refraction on color (wavelength). The lens is more powerful for violet (V) than for red (R), producing images with different locations and magnifications. 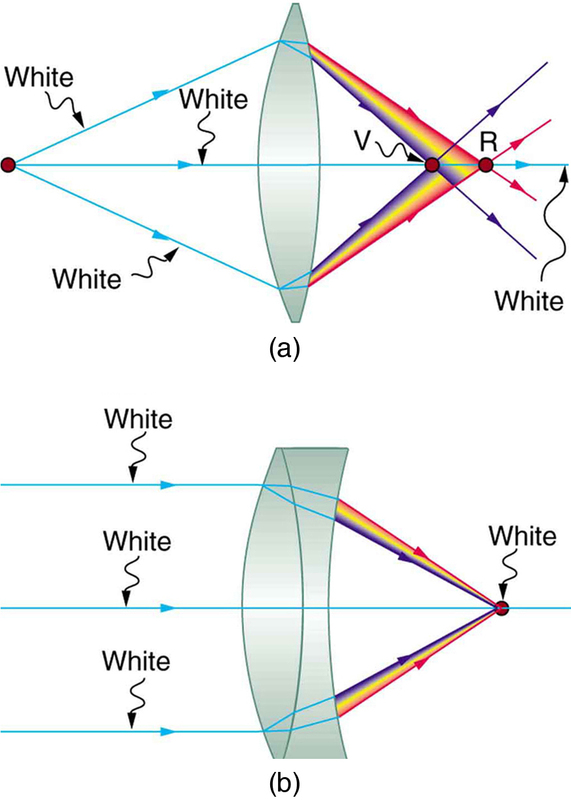 (b) Multiple-lens systems can partially correct chromatic aberrations, but they may require lenses of different materials and add to the expense of optical systems such as cameras. A coma is an aberration caused by an object that is off-center, often resulting in a pear-shaped image. The rays originate from points that are not on the optical axis and they do not converge at one common focal point. 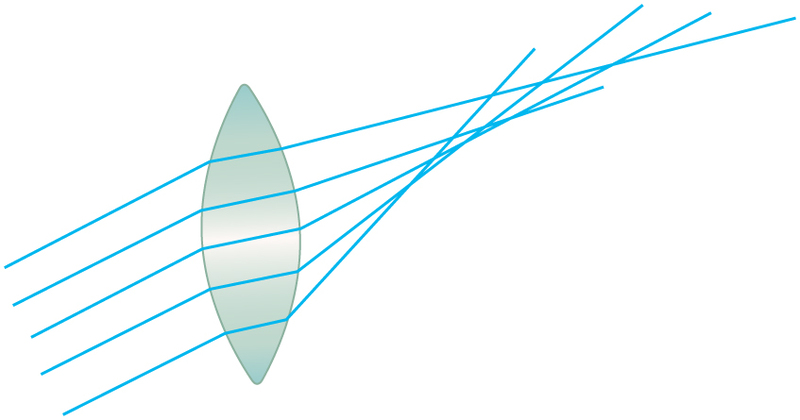 Spherical aberration is caused by rays focusing at different distances from the lens. List the various types of aberrations. What causes them and how can each be reduced? (a) During laser vision correction, a brief burst of 193 nm ultraviolet light is projected onto the cornea of the patient. It makes a spot 1.00 mm in diameter and deposits 0.500 mJ of energy. Calculate the depth of the layer ablated, assuming the corneal tissue has the same properties as water and is initially at 34.0ºC34.0ºC. The tissue’s temperature is increased to 100ºC100ºC and evaporated without further temperature increase.